Question – Explain consumer decision making process. Also explain involvement levels of consumer decision making. Decision is made to solve a problem of any kind. Suppose the problem is to create a cool atmosphere in your living room. For this, what you will do? You will carry out information search, to find ways to cool the atmosphere of your living room, for example, by an air-conditioner, or by a water cooler, or by a wall fan. For this, you will evaluate all the known alternatives and made cost benefit analysis to decide which product and brand will be suitable. Finally, you will purchase that product.Consumer behaviour has two aspects – the final purchase activity which is visible to us and the decision making process interplay of various variables which are not visible to us. In this post we are explaining Consumer decision Making Process. Consumer decision making process consists of a series of steps which a consumer undergoes. 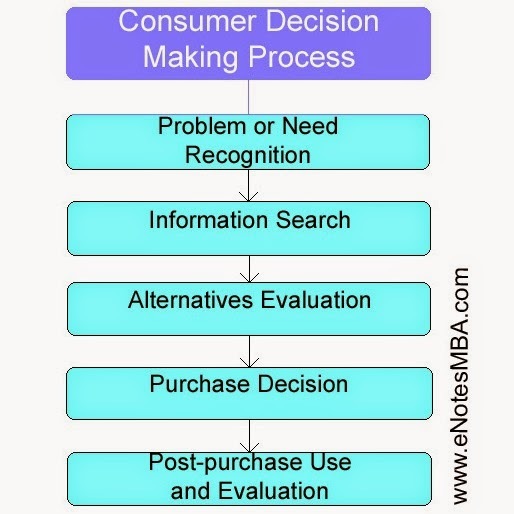 Consumer decision making process generally involves five steps – Problem recognition, information search, evaluation of alternatives, purchase, and post purchase evaluation. Consumer decision making process begins with an unsatisfied need or problem. Everyday we face multiple problems which individuals resolve by consuming products or services. Consumer problem can be routine or unplanned. For example – run out of milk or cooking oil, car indicating low level of fuel, are some of the routine problems that individuals face. Such problems are quickly recognised, defined, and resolved. Recognition of unplanned problem may take much longer time as it may evolve slowly over time. For example - need of a new refrigerator as existing one is not working properly. An individual recognise problem through information processing arising as a result of internal and external stimuli. After problem recognition the action to solve the problem depends on the magnitude of discrepancy between the current state and desired state and the importance of the problem for the concerned consumer. If the problem is highly important for an individual and there is high discrepancy between current state and desired state of the individual, he will start the purchase process. Information search is done to know about product or service, price, place and so on. In the process of decision making, the consumer engages in both internal and external information search. Internal information search involves the buyer identifying alternatives from his memory. Internal information search is sufficient for low involvement products or services. For high involvement product or service, buyers are more likely to do external information search. The amount of efforts a buyer put in information search depends on various factors like market, competition, difference in brands, product characteristics, product importance, and so on. At this step the buyer identifies and evaluates different alternatives to choose from. It is not possible to examine all the available alternatives. So, buyer develops evaluative criteria to narrow down the choices. Evaluative criteria are certain characteristics that are important to buyer such as price of the product, size, colour, features, durability, etc. Some of these characteristics are more important than others. To narrow down the choices the buyer considers only the most important characteristics. The earlier mentioned evaluation step helps the consumer in arriving at a purchase intention. In the decision evaluation stage, the consumer forms preferences among the brands in the choice set. The consumer may also form a purchase intention and lean towards buying the most preferred brand. However factors can intervene between the purchase intention and the purchase decision. A buyer who decides to execute a purchase intention will be making up to five purchase decisions brand decision, vendor decision, quantity decision, timing decision and payment-method decision. Once the buyer makes a decision to purchase a product or service there can be several types of additional behaviour associated with that decision such as decisions on product uses and decision on services related to the product purchased. The level of satisfaction experienced by the buyer after his purchase will depend on the relationship between his expectations about the product and performance of the product. If the buyer is satisfied then he will exhibit a higher probability of repeat purchase of the product or service. The satisfied buyer will also tend to say good words about the product or service. Whereas a highly dissatisfied buyer will not buy the product or service again and spread negative words about service and company.